A large delegation of Arab Knesset members and Israeli Arab public officials arrived Saturday at the Tripoli airport in Libya. "It is a historic visit, which will lead the way to future visits," MK Talab El-Sana told Ynet. The visit sparked anger among right-wing elements, who called last week to punish the members of the delegation. 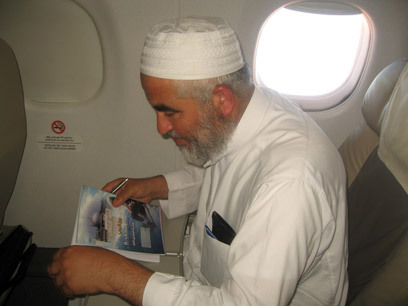 The Arab officials – including the leader of the Islamic Movement's northern branch in Israel Sheikh Raed Salah – were accompanied by Libya's ambassador to Jordan, who joined them from Amman. Upon arrival, the members were greeted by Libyan officials at the airport and later headed to a hotel located on the beaches of Tripoli. "We've heard and learned a lot about Tripoli," said El-Sana. "Seeing it up close is something we've dreamt about – it is very exciting. "The delegation members were especially touched by the reunion between Adnan Juarish, a ramla citizen, and his brother, who he has not seen in 35 years. "There is a large community of Arabs of Libyan descent that live in Israel, and it was extremely moving to witness the reunion between Juarish and his brother and cousin, who's a minister in the Libyan government," said MK Mohammad Barakeh. The Arab leadership in Israel considers the two day visit a breakthrough. Throughout the years, they were never invited to visit any Arab country due to their Israeli passport. "No one wanted to be suspected of trying to normalize relations with Israel, and so we were never invited," explained El-Sana, "People must be able to make a separation – we shouldn't be the victims of the Arab-Israeli conflict." Libya, headed by Muammar Gaddafi, is the current president of the Arab League. "After Gaddafi was chosen he thought special attention should be given to the Palestinian population in Israel. For us it is a very special encounter; as members of the Arab people we feel affinity to the Arab world and its culture – and it is only natural for us to want to visit here," said MK Barakeh. According to the delegation members, Libya is not among the countries Israel declared as enemy states, but noted that there are other countries they cannot visit. "It angers us and violates our basic rights," Barakeh added. In the evening, the delegation members enjoyed a festive dinner at one of the capital's restaurants and watched a folklore and heritage show. On Sunday they will fly to the city of Sirte, where the Arab League Summit convened only a few weeks ago, and meet with President Gaddafi himself. Meanwhile, the delegation was enjoying Tripoli's magnificent sites. "The combination of the sea and the desert is amazing; it is a modern city, the weather is nice, and there is a wall near the beach that resembles the one in Akko," said MK Barakeh. 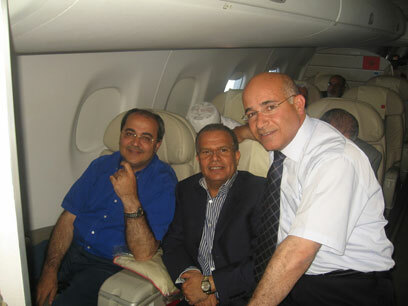 See all talkbacks "Arab MKs in Libya: Tripoli similar to Akko"